More stringent economics than oil and gas. Two drivers cut across all these areas: safety of personnel and the public and environmental protection. EWEA has led the EU Wind Energy Technology Platform (see Chapter 7) and has convened a working group to identify necessary future technical initiatives for offshore wind. These issues are discussed here. Wind turbine technology in general is discussed in Chapter 3, with some future innovative wind energy conversion systems that may be exploited on land or offshore are reviewed under Future Innovations. Better reliability is required offshore. Electrical equipment designed to improve grid connection capability. High voltage output converters (eliminating the need for turbine transformers). 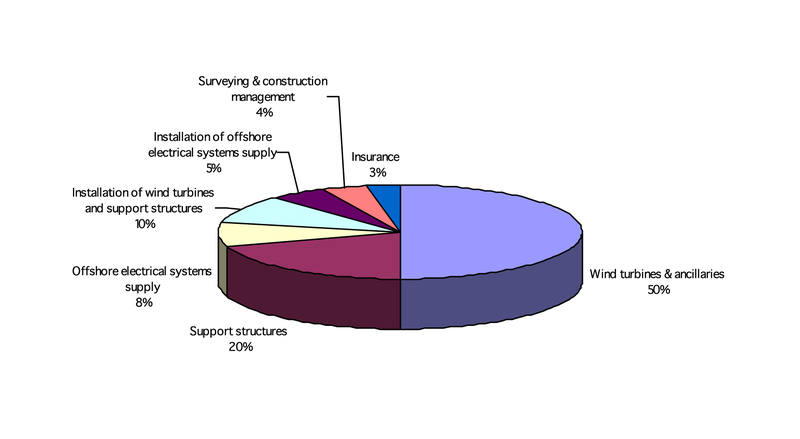 As shown in Figure 5.2, support structures form a significant proportion of offshore wind development costs. It is expected that there will be both innovation and value engineering of structure designs and improved manufacturing processes to improve the economics and meet the demands for more challenging future sites and wind turbines. The development of floating structures, while long-term, will be a major advance if successful. This is discussed further in Offshore Support Structures. Dynamic loads on wind turbines deep within wind farms. Incremental development in electrical equipment (switchgear, transformers and reactive power compensation equipment) is to be expected, driven by the wider electricity supply industry. The offshore wind business will soon be the largest market for subsea cables and so some innovations there may be driven by the specific requirements of the sector, although cables are a relatively mature technology. Voltage-source high voltage DC transmission is a relatively new commercial technology, and one that will find extensive application in offshore wind. The major electrical impact of the offshore sector will be the re-shaping of the transmission network of the countries involved in order to serve these major new generating plants. Also to be expected is an increase in the interconnection of countries to improve the firmness of national power systems, and which may also involve providing an international offshore transmission network dedicated to serving offshore wind projects. Development of safe, efficient, reliable and repeatable processes to reduce costs, minimise risks, guarantee standards and deliver investor confidence. Future offshore wind farms offer new access challenges, being larger and much further offshore. This will result in increased use of helicopters for transferring service crews, larger vessels to give fast comfortable transit from port to site, and the use of offshore accommodation platforms, combined with evolution of strategies to perform O&M. The US DoE has hosted conferences on ‘deepwater’ solutions in recent years. In both the EU and the USfor over 10 years, there has been exploratory research of floating offshore systems and preliminary development of design tools for modelling a wind turbine system on a dynamically active support that is affected by wave climate. Until recently, such technology, even at the level of a first demonstration, was considered rather far in the future. However interest has accelerated and demonstration projects have been announced – indeed the first was installed in 2009 (see Statoilhydro-Siemens). The possibility of system retrieval as a maintenance option. 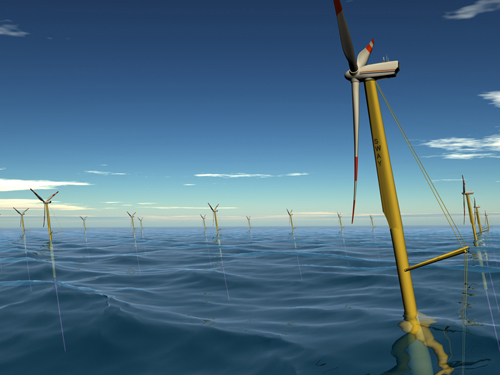 StatoilHydro and Siemens Power Generation entered into an agreement to cooperate on technology to develop floating wind turbines, based on StatoilHydro's Hywind concept. StatoilHydro has built the world’s first full scale floating wind turbine and test it over a two-year period offshore near Karmøy, an island to the southwest of Norway. The company announced the investment of approximately NOK 400 million and deployed the field in 2009. A Siemens 2.3 MW wind turbine (80m rotor diameter) is set on a floating column of the spar-buoy type, a solution long established in oil and gas production platforms and other offshore floating systems. The flotation element has a draft of 100m below the sea surface, and is moored to the seabed using three anchor points. The system can be employed in waters depths ranging from 120 to 700m. The combination of two established technology solutions in the wind turbine and spar buoy may be considered a prudent approach to the development of offshore floating systems. StatoilHydro has also acquired a substantial share in the technology company Sway, which is developing a highly innovative solution for system support. The SWAY® system (Figure 5.14) is a floating foundation capable of supporting a 5 MW wind turbine in water depths ranging from 80 m to more than 300m in challenging offshore locations. In the SWAY® system, the tower is stabilised by elongation of the floating tower to approximately 100m under the water surface and by around 2,000 tons of ballast in the bottom. A wire bar gives sufficient strength to avoid tower fatigue. Anchoring is secured with a single tension leg between the tower and the anchor. The tower takes up an equilibrium tilt angle (typically around 5 to 10°) due to the wind thrust on the rotor. During power production in storm conditions, there is expected to be a further variation of only +/-0.5 to 1.0° from the equilibrium tilt angle due to wave action. The concept exploits active control of rotor thrust, and claims to achieve substantial cost savings over competing technology for deep water applications. The first full-scale wind turbine is expected to be built and installed by 2012. A prototype installation using a concept similar to the tension-leg platform developed in the oil and gas industry was launched in late 2007 by Blue H Technologies of the Netherlands. The concept was demonstrated through full installation and testing in 2008 in a water depth of over 100 m, approximately 17 km offshore from Puglia, Italy.